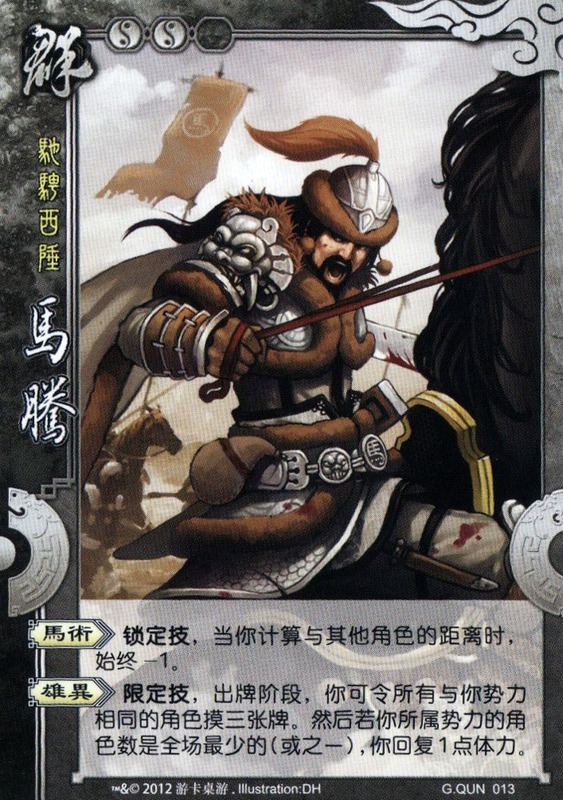 "Galloping through the Western Border 驰骋西陲 (chí chěng xī chuí)"
Among the father and son relations in ROTK, Ma Teng and Ma Chao 马超 was left out for some reason by SGS creators till now. We all know that Ma Chao was one of Liu Bei 刘备's most trusted generals, but his father, Ma Teng, was quite exemplary as well. Born into poverty, he crawled from rags to governorship through his charisma and skills. Alas, Ma Teng was not single-minded in his loyalty, switching back and forth between ally and traitor. His reckoning came when he plotted against Cao Cao 曹操, only for the plot to be discovered. Ma Teng died and nearly lost his entire family. Ma Chao escaped though, and the rest is history! Your physical distance to other players is reduced by 1. During your action phase, you can let every players of the same Kingdom as you draw three cards each. If your Kingdom has the least (or amongst the least) number of players among all the Kingdoms in play, you regain 1 unit of health. “Horsemanship” is the traditional ability of generals from Liang Province, for leading elite forces of cavalry. “雄异” was a term originally used to describe the charsimatic look of Ma Teng, and refers to Ma Teng’s superb leadership in leading his troops. This ability provides a burst of cards for all players of your Kingdom, symbolizing the power of Ma Teng’s massive troops of horsemen that ravaged the enemy in a sudden. Can I ask, for his single-use ability, can he himself draw 3 cards? Yes but not they. Only you can heal 1 hp , not all of you. But all of you draw 3 cards.